If you are searching for the best senior walkers on the market, but you don’t have a lot of time to spare, this paragraph should help you out. After assessing the market by analyzing the quality of the products and after looking at what previous users had to say about the available units, we have concluded that the Drive Medical Nitro Euro Style is the model that you should purchase. This item is ultra-compact, and it can be collapsed by using a single hand. Additionally, the model has adjustable ergonomic grips that you will undoubtedly enjoy. Even more so, this device has a removable back that is also adjustable. If the Drive Medical Nitro Euro Style is out of stock, do consider the Folding Walker by Vive as it is a reliable second choice. It is ultra-compact in size and can be easily collapsed with the use of just one hand. The walker is made from lightweight aluminum with a built-in brake cable for extra safety and protection. The seat and handle height are adjustable to provide universal relief. We found a few customers that have reported that the package came with missing parts that were essential to the product. Make sure you have all the parts when your order arrives. The Drive Medical Nitro Euro Style is a very compact model that seeks to offer increased comfort and reliability to your senior to help him or her move around with great ease. The two-button release mechanism allows this portable walker to be folded down quickly for convenient storage or travel. The rubber hand grips are textured to provide a non-slip and secure grip. The aluminum frame is durable and light and can support a weight of up to 250 pounds. We found one particular customer who complained that the walker couldn’t be folded using only one hand because the locks were very stiff and that can make it impossible for some seniors to use it. The Folding Walker by Vive is a great option for users that want to get an affordable product that is capable of meeting the requirements of quality and reliability. This unit is equipped with a 6” rubber wheel and a 1” base which makes the walker reliable for both outdoor and indoor use without having to worry about bumpy rides. You also get NOVA’s patented feather touch hand brakes that are easy to engage with just a push of a lever. Customers were not happy with the customer service that NOVA provided. They reported that if your walker ever breaks, you are likely to spend a lot of time waiting for it to get repaired. With the NOVA GetGo Petite Rollator, you get a walker that is easy to use and versatile seeing as it can be used on all terrains, and can handle both indoor and outdoor use. We know just how difficult finding a reliable product can be. Because of this, we have put together a list of high-quality items that you might want to consider before you make a choice. So, read ahead and see which one best suits your needs. If you are trying to find a handy and comfortable product, look no further than the Drive Medical Nitro Euro Style. This model features a lightweight frame that is made from aluminum, which is the reason why the walker is both easy to maneuver and very durable. Moreover, this device comes fitted with sizeable front wheels that make it perfect to use on various types of terrains. To make the unit even easier to adjust, the manufacturer has supplied the item with height adjustable handles and an adjustable back for total customization. The screws that allow for this type of adjustments can be installed without the help of a tool. Consequently, the process does not require a lot of effort. You can effortlessly transport the model because it can be folded in between uses. This way, the model won’t take a lot of space in your car or home. A removable carry pouch and a brake cable for extra safety are also included in the price of the item. The product has received plenty of positive reviews, and it is currently regarded as one of the most reliable models out there. According to the previous buyers, this makes for a good present for a senior. Another unit that you might want to give a good look to is the model designed and sold by Vive. This device comes outfitted with a two-button release mechanism that enables the user to effortlessly fold down the product so that one can store it in a convenient way. What is more, the manufacturer guarantees that even people with low dexterity can operate the buttons with no difficulties. Likewise, this unit features soft, rubber hand grips that won’t slip from your hand. As a plus, the ribbed hand grips are contoured and, therefore, they provide more stability, and they reduce hand fatigue and hand pressure. When shipped, this model includes a carry bag that you can attach and remove in accordance with your needs. If you intend to use this model on uneven surfaces and you don’t want to struggle while doing so, you can always use the five-inch rubber sports wheels that are also included in the deal. The frame of the unit is made from extruded and anodized aluminum, and it is said to be lightweight, durable and sturdy (it can support up to 250 pounds). You can adjust this model however you want. The product is covered by a 60-day unconditional guarantee. If you are slightly short and you have trouble finding a suitable unit, check out the product created by Nova. 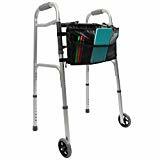 Because the model was designed to suit petite users, this walker has a 22” narrow frame that is effortless to maneuver through tight doorways. Although the model is rather small, it can actually support up to 300 pounds. The design of the product includes Feather Touch locking hand brakes, a highly efficient feature that has been patented by the manufacturer. This way, the user has complete command over the speed and the stability of the item. A large and padded seat and a seat pouch for storage are also provided. Consequently, whenever you grow tired, you can always take a small break in order to avoid fatigue. The model comes with an additional Lock n’ Load setting that locks the model in the folding position, and this makes the item easy to carry/lift. The height of the handles is adjustable (from 29″ to 33.25″). The device user’s height should be between 4’10” and 5’4″. This model is considered durable and easy to use, and most of its users warmly recommend it to other interested purchasers. If you want to purchase a model that supplies its users with a backrest, the Hugo Elite Rollator might be the product for you. This device stands out because of its 2-inch height adjustable built-in seat that has a backrest option. Also, the design of the product features a seat where you can sit and rest when necessary, as well as an under-seat storage bag where you can keep the essentials. The handles of the model are height adjustable so that the user has an appropriate posture while using the walker. Furthermore, when used in the right manner, the device supplies the person utilizing it with a natural hand angle and a better access to the brakes. As a plus, when assembling the model you don’t need any type of tools. Similarly, the model can be effortlessly folded down when you want to store it in the trunk of your car. The product has been designed in such a manner so that it can support up to 300 lbs. Likewise, this is a good investment if you suffer from a condition that compromises your overall balance. The product is very reliable as it offers its users the necessary stability. Another model designed and produced by Hugo is the Portable Rollator. Although this unit is a bit pricier than its similar counterparts, most of its users and many of the specialists consider it a great investment. The unit features a storage pouch that is placed underneath the included seat. Thanks to the bag, you won’t have to carry your belongings in your hand anymore. The device features adjustable handlebars that enable you to keep a good posture throughout the day. Moreover, the grips of the handles have been ergonomically designed so that your hands are held at a natural angle while you move. This aspect is crucial because it provides you with better access when you walk. To assemble the walker, you just have to snap it into place. Moreover, because you don’t need to use any type of tools while setting it up, you will be able to get around without extra help from your loved ones. The most significant advantage of the item is the fact that, although it has four wheels, this device is fitting for people that suffer from medical conditions that have compromised their balance. The model can be used with the extra 8’ wheels and, overall, it can support people that weigh up to 300 pounds. Another four-wheel unit that has received outstanding reviews from previous buyers is the one designed by Drive Medical. This model is price efficient, and it comes outfitted with a handful of features that any senior is likely to appreciate. For instance, this device only weighs 17.9 pounds, and it comes provided with a sturdy steel frame that is said to pass the test of time. Moreover, a set of hand brakes are situated on the handles of the unit so that the user can have direct access to them. Additionally, one can use the brakes to lock the walker in place whenever this is needed. The design of the device includes a fold-up seat that supplies the buyer with the time to rest whenever he/she considers it necessary. Also, a backrest is provided for additional support. What is more, a lever that is effortless to turn is located on the handlebar of the device. By using it, you can quickly change the height of the unit. The model can be folded whenever you want to store or transport it without it taking up too much space. The unit includes large 7.5’ wheels that are suitable for both indoor and outdoor use. Another model that might stir your interest is the Trigger Release Folding produced by Drive Medical. This device is fitting for those people that are looking for an indoor model that comes supplied with small wheels (5 inches). The unit has a release option that lets the person using it to close the device without taking his/her hands from the handle while doing so. Consequently, this model is perfect for those that have limited dexterity. The handgrips of the unit are contoured, soft and they release any pressure that might be placed on one’s hands. The frame of the device is made from aluminum and, as a consequence, it is sturdy and durable, yet at the same time, lightweight. Because of the glide caps that cover the wheels of the product, the user is supplied with a smooth transition over all kinds of surfaces. The product has a depth of 16.75 inches, a height of 32’ and a width of no less than 25’. The unit weighs 7 lbs and it has a capacity of 350 lbs. Previous buyers of the model have said that this walker is a good purchase. Still, you should know that this device does not have a brake. Therefore, you cannot make it stationary. The product sold by Able Life is another item that is worth your attention. The main feature of the model is its foldability. To be more explicit, this unit can be folded to 7’ whenever you have to navigate through narrow passages or when you have to store it in small spaces. When shipped, this model includes a pair of stationary wheels. Swivel wheels are also compatible with the product, but they have to be purchased independently. The product is hand adjustable, and it can suit users that are 4’10” to 6’8″. To adapt it to your height, you have to use the handles. The manufacturer describes the model as the lightest product on the market and says that it is ideal when traveling. The unit supports up to 400 lbs., making it fit to be used by a wide range of people. The model comes fitted with feet that glade easily so that you have total control over it, no matter the surface that you are walking on. The wheels of the unit have a diameter of 6’. The product is excellent for indoor use. Still, this device does not have brakes. As expected, the model has received many positive reviews. This selection would have been incomplete without us reminding you of the 100RA Steel Rollator model. This walker supports up to 350 lbs. and it has convenient 6’ wheels that are quite versatile. A padded seat for extra convenience and the backrest are said to offer the user the needed comfort. Similarly to the other units that we have discussed, an extra under the chair bag (that measures 12 x 7 x 6 inches) is included in the unit’s design. The product weighs 19 lbs. and it can be folded flat for transportation and/or storage. The model is adjustable. The product is not shipped already assembled. Still, current users say that the process does not take an extended period of time and that the buyer does not have to use special tools to mount it in place. Nevertheless, the hand brakes come pre-installed for extra safety. A previous buyer has noted that this model is a bit narrower than similar units, which is a reason why you might find it easier to use when going through tight door frames. The manufacturer of the product advises its users that they make sure that the brakes of the device are locked before they sit on the chair. If you are in the market for the best walkers for senior citizens but you don’t know what features to pay attention to, this following buying guide should help you make up your mind. So, keep on reading and see what aspects should not be ignored! As one grows older, his/her ability to walk easily might diminish. Still, this does not mean that one has to give up being able to walk on a daily basis. To help you out, various manufacturers have created a number of walking devices that you can use whenever you want to do so. According to specialized reviews of walkers for seniors, one can choose from a variety of models that are available: walking frames, two-wheeled units, rollators, and even three-wheel walkers. The walking frames or the zimmer frames have no wheels, and, consequently, you have to pick them up every time you take an extra step. Although they are usually lightweight and they allow you to place significant weight on them, they might not be suitable for people with bad balance or for those that get tired easily. Next, the two-wheeled units are usually highly appreciated by seniors. As the name suggests, these models combine the advantages of the walking sticks with the extra mobility supplied by wheeled products. These devices are highly stable, and they allow you to move easily with little to no effort. Rollators are another highly acclaimed option that you might want to consider. Some specialists believe that these models are good senior walkers because they come provided with an additional seat and a backrest. Moreover, these items usually have added brakes that help you stay in command at all times. Still, make sure that the model that you select has a responsive braking system that you can 100% rely on and know how to operate. To get an insight of a product’s capabilities, read the feedback left by previous buyers. If you are scouring the market in hopes of finding a model that is highly maneuverable, you should think about investing in a three-wheeled walker, as the models that you can find up for sale are very light. Still, these units don’t come fitted with extra support or with a seat. If you are set on purchasing the best walkers for older adults, we recommend that you pay attention to the maneuverability and the comfort of the chosen unit. As you probably know by now, some of the available products out there come provided with frames that enable one to go through narrow doorways with no difficulties. Even more so, those units that include brake options should be considered as they are safer than their counterparts that do not come outfitted with this feature. However, if you intend to gift a product of this type to a senior that is not used to using such a device, be sure to explain to him/her how the braking function works. This way, you can avoid unhappy accidents. When it comes to the comfort supplied by the device, you should check to see whether or not the model that you like has a backrest and an added seat. These two aspects are crucial because seniors often grow tired while walking. Therefore, it is best that they have the choice of resting for a bit before they continue their walk. Additionally, the best walkers for elderly people are the ones that are easy to use. From this point of view, you should search for a product that can be assembled effortlessly, and that can be folded without much difficulty. This way, the person using it will be able to transport and store the model in between uses without the help of somebody else. Consequently, this might help him/her feel independent. To purchase quality senior walkers, you should also pay attention to a couple of extra features that might come in handy. For instance, the product that you end up investing in should be durable. The best way to verify this is by looking at the materials used to make the frame of the unit. Most specialists recommend that one opts for models made from aluminum as this metal is both lightweight and likely to resist any abuse. The size and the weight of the walker should also be considered. Because walkers do not have a universal size, you should take the time to see if your height and weight are compatible with the model that you like. To be sure, we suggest that you read what previous buyers of the model had to say about it. What is more, senior walkers reviews advise that you always pick a lightweight device as it might be easier to manage throughout the day. As a plus, before you order one of the cheap senior walkers that you can find online, go ahead and make sure that the product that you have in mind is also suitable for outdoor use. This feature is a must, especially if you enjoy getting out of the house. Still, don’t forget that not all products are suitable to be used outdoors. Even more so, remember that going outside is considered beneficial for the health and the wellbeing of a senior citizen. Another feature that should not be overlooked has to do with how quickly one can adjust the height of the unit. As you probably already know, some models come with the option of changing the height of the seat and that of the handlebars. A reliable model should not require a lot of effort to do so. This aspect is particularly true if you have low dexterity. Last but not least, if you enjoy traveling by car or if you have limited space in your bedroom for storing such a device, you should invest in a model that is foldable. Again, if the unit that you select is lightweight, the process of folding it won’t require a lot of effort. Another critical aspect that is worth talking about has to do with the safety of a senior walker. No matter how effective this instrument is, new studies have shown that, if not trained/instructed on how to use a product like this correctly, seniors risk the chance of getting hurt. What is more, it is vital that one picks the correct type of walker that suits one’s height and weight as this can help him/her avoid falling while using the device. Likewise, it is recommended that a physical therapist is employed to teach seniors what the correct way to use a walker is. Nonetheless, if the product that one opts for has wheels, brakes should be a must. The reason for this has to do with the fact that wheels can often glide way to fast and, when walking on slippery surfaces, one can easily lose its balance. Because of this, brakes are a must as they can prevent the occurrence of painful accidents. When using a walker, it is recommendable that a person takes small steps and that he/she keeps the unit closer to his/her body. This way, extra stability is added. Moreover, it is best that one wears shoes or socks that are non skid and that one removes the carpets and/or rugs that might make walking with an aiding device difficult. Besides, the specialists insist that, when using a walker, one keeps his head up, so that one’s balance is maximized. Similarly, at all time, one has to keep his/her hands directly on the unit’s handles. Any additional items that you might carry should be placed in the bag provided by the manufacturer. This way, you will be able to keep your stability at all times. Last but not least, before you take a step, be sure to move the walker firstly and only then actually walk. Before you do so, don’t forget to verify that the walker is steady. If this is not the case, use the lockdown function or change your position so that your balance is not compromised. Another aspect that should not be ignored has to do with maintenance. According to seasoned experts, if the walker is not cared for properly, seniors are prone to get injured. Similarly, broken devices are more difficult to operate, and they can make the user feel tired and unhappy. Consequently, his/her sense of independence might be bruised. Given these facts, any walking device should be regularly maintained. To do so, you should have it assessed by a specialist in this line of products. However, no matter how much you spend taking care of it, a walker has a limited lifespan. As a result, you should accept that, once the model is overused, you should acquire a new unit. If you follow our suggestions, we are confident that you will end up with a reliable, safe walker that will be worth every penny. So, don’t waste any more time and place that order; you surely won’t regret it!